CAT5 vs CAT6 Cable -What’s the Difference? What is the difference between CAT5 and CAT6 cable? Answer: It’s all in the number of cable pair twists and increased shielding. The more twists in the cable pairs the cleaner the signal. That’s because twisting the cable pairs cancels out the interference or “bleed over” / “crosstalk”; thereby allowing for more information or “bandwidth” to flow through the cable. CAT 6 cable has more twists than CAT 5 or CAT 5e cable; therefore, it uses more copper wire and shielding so generally costs more. CAT 5 Cable – Ethernet and Fast Ethernet. CAT5 is rated at a speed of 100 Megabits per second. CAT 5e Cable- Ethernet, Fast Ethernet, and Gigabit Ethernet. CAT5e is rated at a speed of 350 Megabits per second but may reach speeds up to a Gigabit. CAT 6 Cable – Ethernet, Fast Ethernet, Gigabit Ethernet. CAT6 is rated at a speed of a Gigabit but may reach speeds up to 10 Gigabits. • Network speeds are NOT the same as your Internet Connection speeds. Any of these cables will most likely handle your local internet connections just fine. 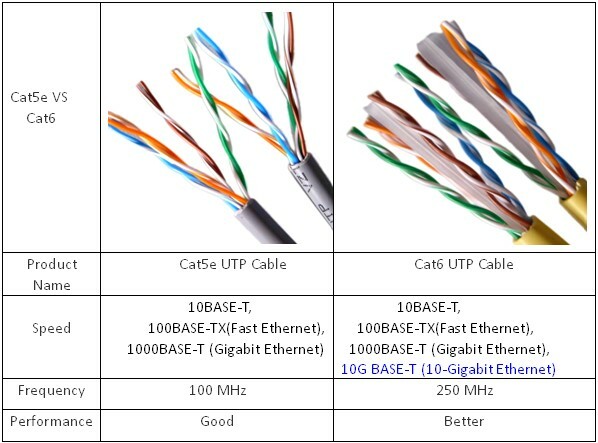 • CAT 5e is the most commonly used cable at this time and generally provides more than enough bandwidth for home and small business applications. Metro-Tel uses this type of cable and does NOT charge any more for it than the slower CAT 5 cable. • CAT 6 is mainly used in large corporate business when transferring large amounts of data from server to server – onsite. It generally costs MORE. • REMEMBER: Networks are only as fast as the weakest link. Using CAT6 cabling without having Gigabit infrastructure (routers, jacks, network cards, etc) will only be as fast as the lowest rated piece of equipment – THEREFORE be aware of your hardware limitations, and you can save yourself money by purchasing the correct cable for your needs. Metro-Tel phone and data experts can help guide you if you have any questions. The Metro-Tel team of experts has been servicing the Dallas – Fort Worth area for decades and can help you decide which is right for you. If you have any questions regarding what cable is best for your business – then use this “Contact Us” link for a rapid response answer!